5-10-12: New development video added! Check it out if you'd like to see an early iteration of the inventory and some resource gathering. 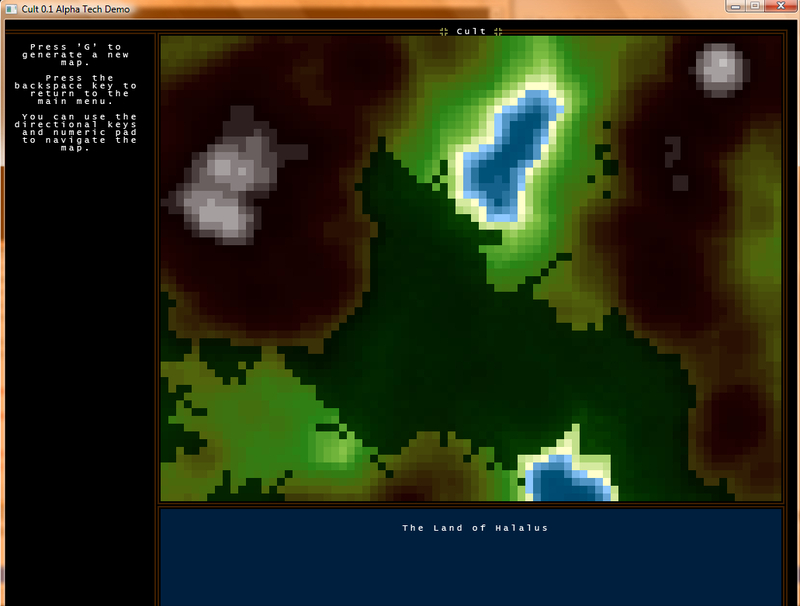 3-26-2012: I've just uploaded a couple of development preview videos to YouTube. Please check them out here and here. Cult is a multi-genre RL (roguelike) variant game that is currently in the early development stages. It is coded almost entirely in Python (although some processor-intensive parts of the code are replaced by C/C++ extension modules in order to increase speed) and utilizes the excellent libtcod library for roguelikes. Because the combination of these goals makes for an inarguably epic scope of gameplay, Cult is intended to be a long term project which will hope to one day combine all of the above aspects of play into a single gaming experience that will deliver an incredible amount of replayability and customization to the player. In the short term (and probably far more practically), the main developmental goal is to establish a functioning (and hopefully interesting) world for the player to explore and to add features piece-by-piece which will gradually allow the main character to influence their world in new and exciting ways. Thanks to the Bay12 community for all of its excellent support and suggestions thus far. Thanks to Toady One and Threetoe for all of their incredible work on Dwarf Fortress, for hosting the forums, and for releasing their games to the community for no charge. This topic will remain continuously updated until such a time as I announce otherwise. Updates of significant note will be reflected on the Cult development blog. There is a brand new alpha tech demo released today! For more details, SEE THIS POST. 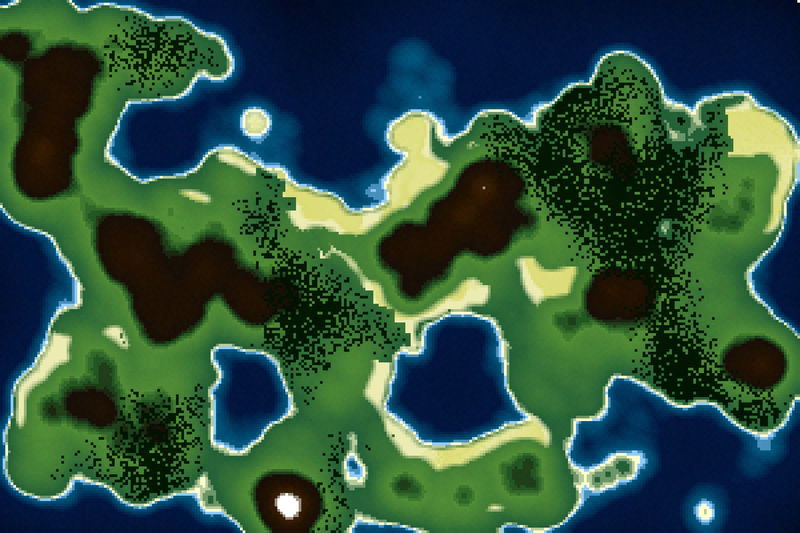 Several videos have been added to the devblog since I have begun working on regional map generation and game mechanics. Check the spoiler below for links to a few of them. About the gameplay: do you mean for this to be a political maneuver-fest? Because that would be awesome. For example, how does one interact with other people? Other high priests? Could things potentially get violent? Political maneuvering should certainly be a part of the game, although the player will also have the option of throwing in the diplomatic towel and simply going to war with a civilization. The game will lend you the benefit of being a sort of religion-ization, which is probably a bit unrealistic but will (I think, anyway) offer a lot more fun and options than being one or the other. Could things potentially get violent? The menu's background noise looks like it's lagging on my computer. Is this made in Python and then compiled to an exe? Yes this idea sounds great, political maneuvering + frenzied cultists can only lead to good things. But yeah will political maneuvering just involved diplomacy and stuff or will here be the option to say convert the masses of another nation and turn them against their own religion ect? Yes, this is compiled Python - however, the lag you're seeing is a result of me forgetting to switch a variable back to its original setting. Try downloading this file instead, which has been recompiled to fix it. By the way, for anyone who is downloading the .exe, I neglected to mention that you *can* move the view around in the terrain generator with your directional keys/numpad. Can you tell what python module are you using to play the music? I'm making a roguelike engine in Python with Libtcod, and it is almost finished, but I am having problems with playing sounds. I am currently using the Python's built-in module winsound, which can only play wav files. I'd like to see it in a more finished state some time. [7:53:55 PM] Armok, why did you demand that I don't eat you? I am not saying that I could make any music here, but since the focus of this project is to deal with gods, shouldn't the music feel more mysterious and mystical rather than a generic medieval tune? 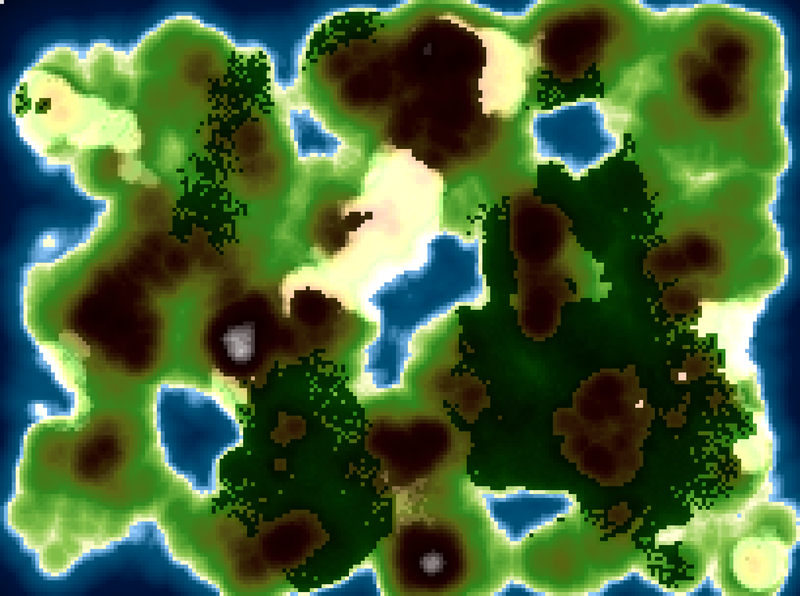 So, forests are now generated during worldgen. This was more of a pain to implement than I'd anticipated, but now that the basic code block for generating new map square types is finished, it'll be easy to copy them over for snow and other features. The way terrain and map feature generation will be set up, it'll also be really easy to check for different types of parameters in map squares and generate local maps on-the-fly based on those parameters. Random names for humans (males) and human-related places are now also able to be generated. It's the music module from Pygame. I wouldn't advise using any other parts of Pygame, though - it's bloated and has a lot of unnecessary code overhead. But the music part of the module does let you play midis and mp3s, and it's the only module to do so that's still maintained regularly (that I know of). Yes, you're probably right. Right now I've just got it looping an old Irish folk song (it was mostly a test to see if music played properly). The reason something better isn't playing is the same reason I have a request up in the OP for help with music. 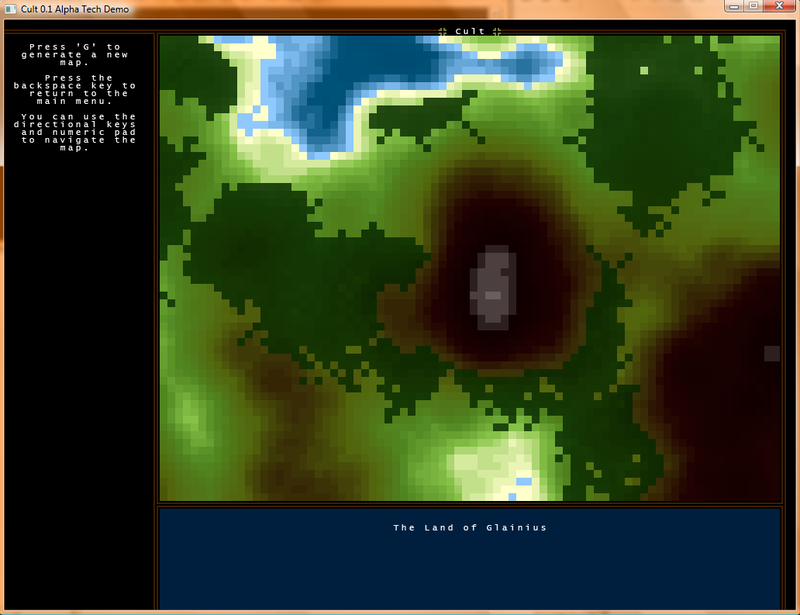 A quick update - forests are now blitted to the screen differently, and grassy plains have been made more green. Time to start on deserts and snow. The game also now exports a copy of the world map upon worldgen. 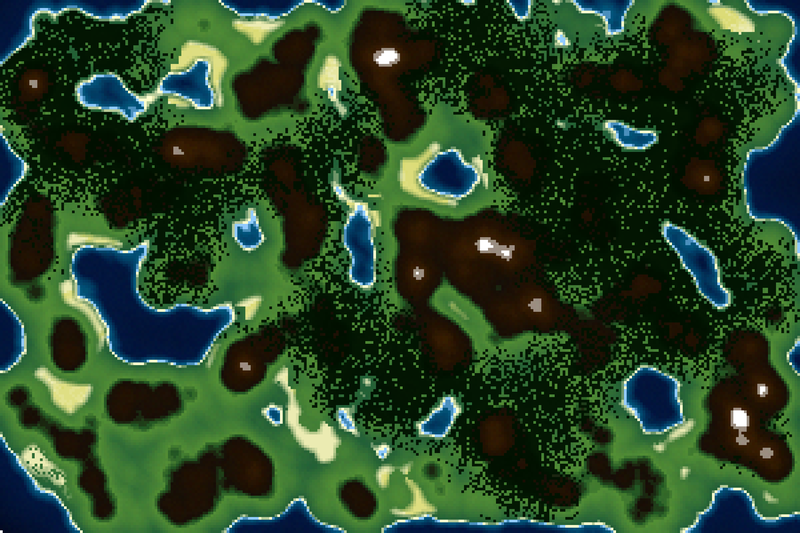 Not quite perfect yet, and there are still a few artifacts being generated now and then that I want to clean up, but it's getting much closer. Snow is all that's left before moving on to site generation! 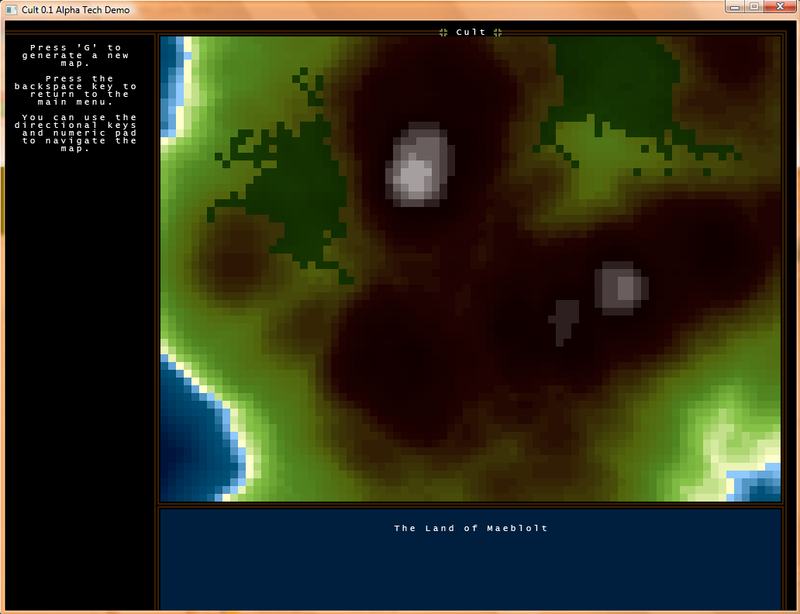 So, worldgen has been retooled quite a lot. 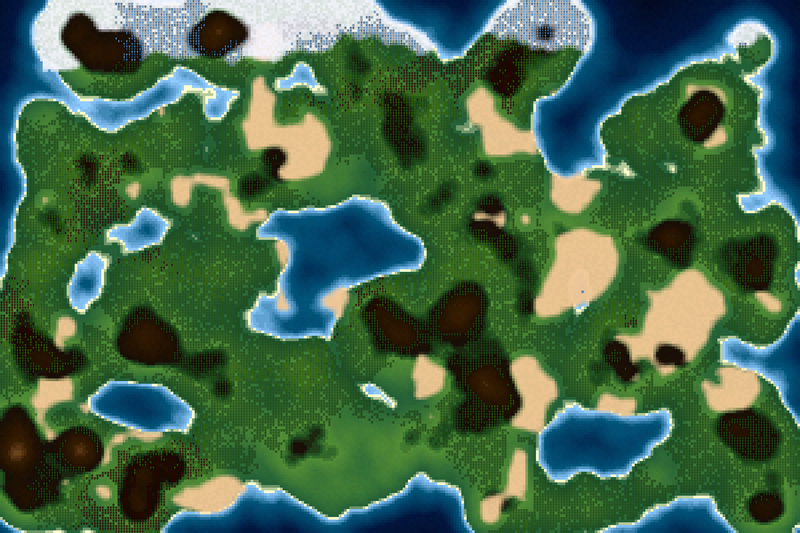 Deserts now blend in with their surroundings and world features are generated in much more natural ways. Snow is done! 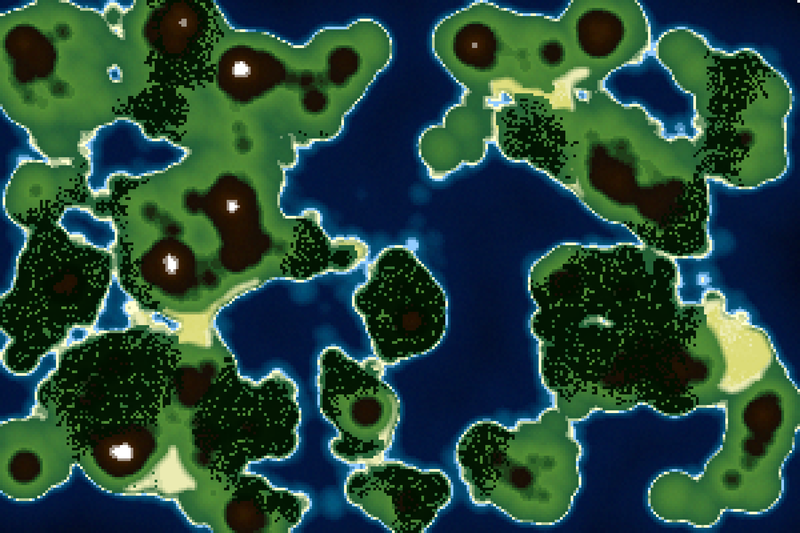 The world will be generated with an arctic cutoff line that wavers slightly from a general 20%-ish setting. 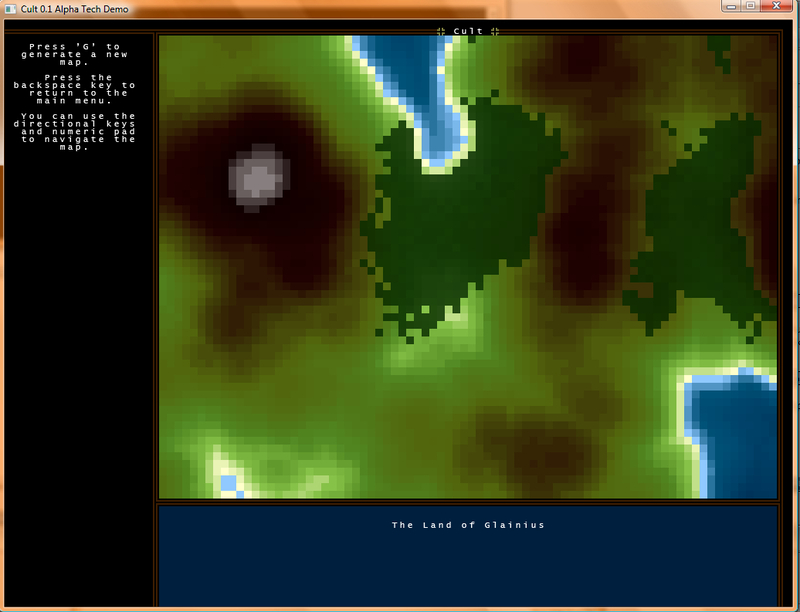 Additionally, worldgen has been significantly retooled. Forests now vary in type so that an adventurer will encounter several different varieties of forest type while exploring. The Land of Noxivor - Lots of deserts in this one. You may have observed that islands completely separated from the mainland occur. This is okay, since travel by boat will be a feature of the game. 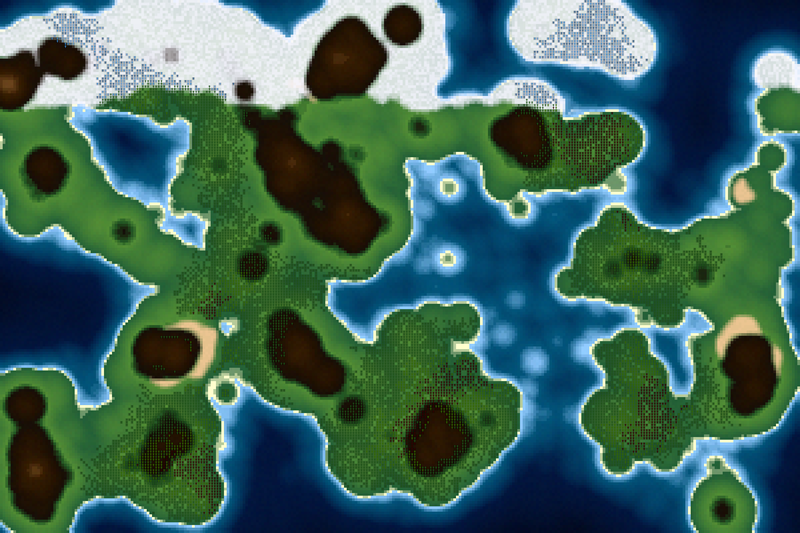 Archipelago-type map formations also happen now and again, and the game will eventually have tinkerable-with worldgen parameters in order for players to specifically force such a world into generation.